In the past year I’ve hosted two Owl Baby Showers, one for my sister-in-law Jenny and one for our cousin Elizabeth. 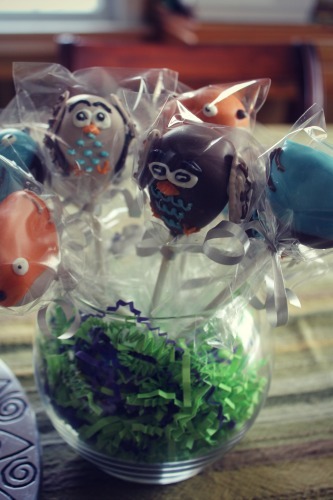 I loved creating parties with an Owl theme – Ella and I had so much fun putting together special touches for our guests to enjoy. 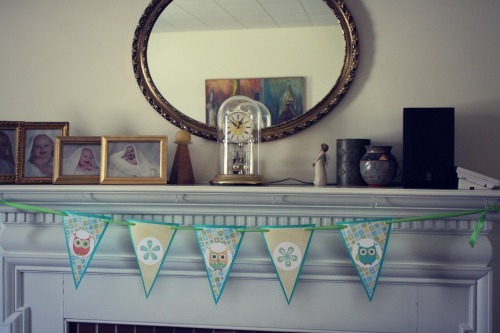 I’m not one that likes to spend a fortune on parties, or to go too overboard, but it was so easy to find cute ideas for these parties that I couldn’t help but go a little Owl-crazy. 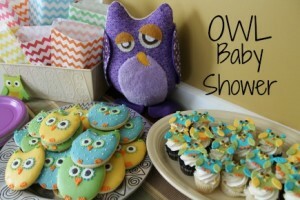 I thought I’d share some of the ways we put together fun Owl Baby Showers without breaking the bank. I hope this helps you plan a Owl Baby Shower! Fun & Games :: For both parties I printed out “Words of Wisdom” cards for the guests to share tips for the Mama to be. I found the Words of Wisdom Cards in the Party Stork Etsy Shop. I think it’s nice to arm new moms with down to earth advice from loved ones. 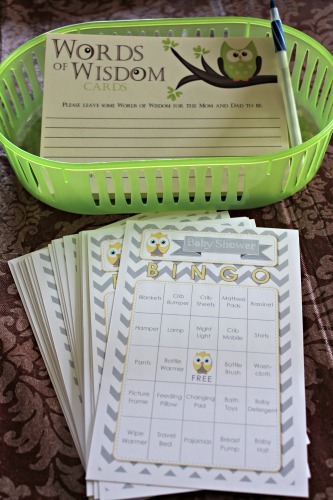 I also printed Owl themed BINGO cards that I bought from the Bee’s Knees Design Shop on Etsy. This is my favorite game to play when hosting a shower, because it makes the present-opening more interesting for the guests. It always cracks me up when this game turns a rather tame shower into a major competition. For prizes I give Cards by Katie Note Cards of course! We also played “Name That Baby“, which is an awesome conversation starter and highly amusing to watch people try to guess which baby is which. Here’s the instructions for how to make the Name That Baby game. Decorations :: I bought Owl Clip Art from the Sara Ink Etsy Shop and used that Clip Art to design the invitations for Jenny’s shower, and also used the owl images from this set to create a banner to hang on the fireplace and also little Owl stickers to put on the bottom of Hershey Kisses. 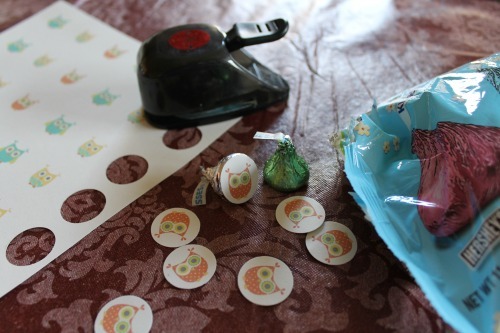 I printed a bunch of tiny owls on adhesive paper and then punched them out with a circle punch before sticking them on the kisses. 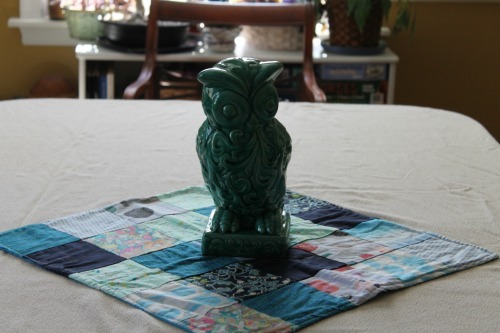 We also put a ceramic owl of Ella’s on the dining room table. For Elizabeth’s shower I bought small stuffed owls & birds from her registry and hung them from my chandelier. But I forgot to take a picture of them…ooops! Sweet Treats: I went with local bakers for the desserts for both parties – I’m lucky to be friends with some fabulous ladies who are in the business of making amazing sweet treats! For Jenny’s Shower the Cookies and Mini-Cupcakes were designed using the owls on her invitations (and decorations above) as inspiration. 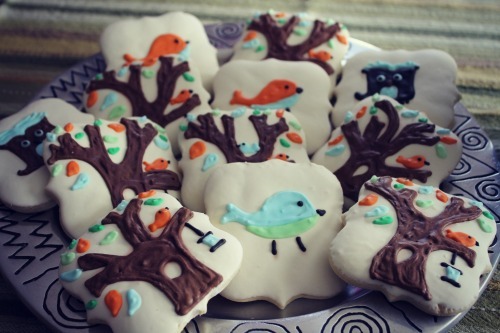 For Elizabeth’s shower I used the owls and birds from her nursery set to inspire the bakers. They all did a fabulous job! Three cheers for Desserts by Micaela, Vivian Sweets and Sweeti Graffiti who are all based in Northern Kentucky. The Snacks: For each of the parties I went with a simple approach…we had sweet treats and appetizers/finger foods. We had small sandwiches and a variety of hot appetizers, fruit, chips & dip, and more. 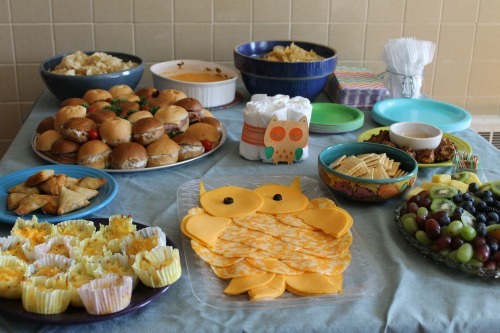 Check out that adorable “OWL” cheese tray that Jessica made! 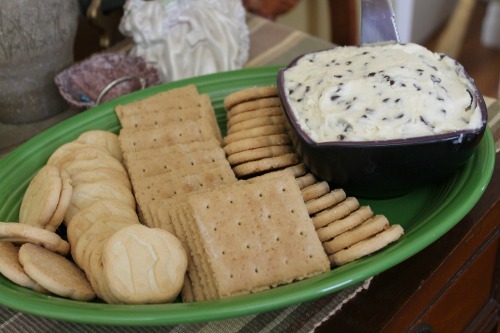 She also made the Chocolate Chip Cheeseball pictured below. That’s a recipe worth pinning! Delish! Check out my Appetizer Archives for more ideas. 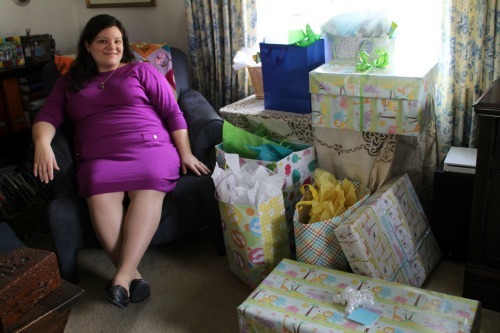 Also…notice the cute centerpiece on the table below – diapers wrapped in ribbon with an owl attached, my sister in law Jessica made that! The Goodie Bags: I made little bags full of treats to give the guests at Jenny’s Baby Shower, and I also made some for Elizabeth’s shower, but in all the catching up with family I forgot to hand them out…doh! Jenny’s goodie bags included a few Cards by Katie Owl Note Cards made with Clip Art from Pink Pueblo on Etsy, along with some of the Hershey Kisses adorned with Owl stickers & Reece’s Cups. 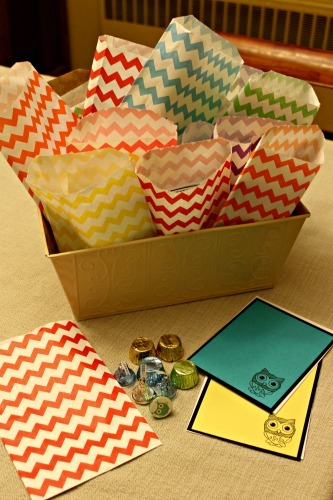 I put the goodies into Chevron paper bags from Whisker Graphics. Sweet & Simple! 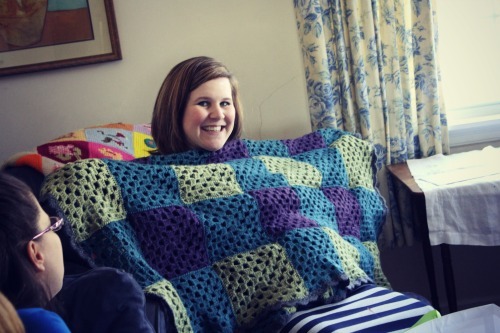 Baby Shower Game: Name That Baby!